Late summer brings us an amazing array of wildflowers. First the ragged, pale-blue chicory blossoms appear alongside the stately white umbels of Queen-Anne’s lace, gracing roadways and pastures. These are followed by the tall, lavender Joe-Pye weed n low-lying areas, and finally we become awash in brilliant oceans of mustard-yellow goldenrod blooms. At the same time, hay fever symptoms are ramping up. As goldenrod becomes the dominant wildflower on the scene, an increased pollen load in the air is making life miserable for those who suffer from allergies. Because of this correlation, it seems logical to blame goldenrod for one’s red itchy eyes, sinus congestion, sneezing, and general histamine-soaked misery. But there is an easy way to tell for sure if goldenrod is to blame, a one-question test: Have you noticed a lot of bees up your nose recently? If yes, then goldenrod might be guilty. If no, there is another culprit lurking about. While most plants respond to late summer’s shorter days by starting to wind down their business for the season, goldenrod is a “short-day” plant, the kind that is stimulated to bloom by waning day length. It’s a perennial in the aster family, and is widespread across North America. We have something on the order of 130 species of goldenrod in the genus Solidago. As one of the most abundant blooms of late summer and early autumn, this native wildflower is for many insects, including numerous bee species, a vital source of nectar as well as nutritious pollen. Unfortunately, this latter item has given goldenrod a black eye among many allergy sufferers. Though goldenrod’s showy yellow flowers are in full view on roadsides and in meadows and pastures, it can’t be guilty because its pollen is very heavy. That’s a relative term, I suppose, since it is light enough for bees to carry it around. 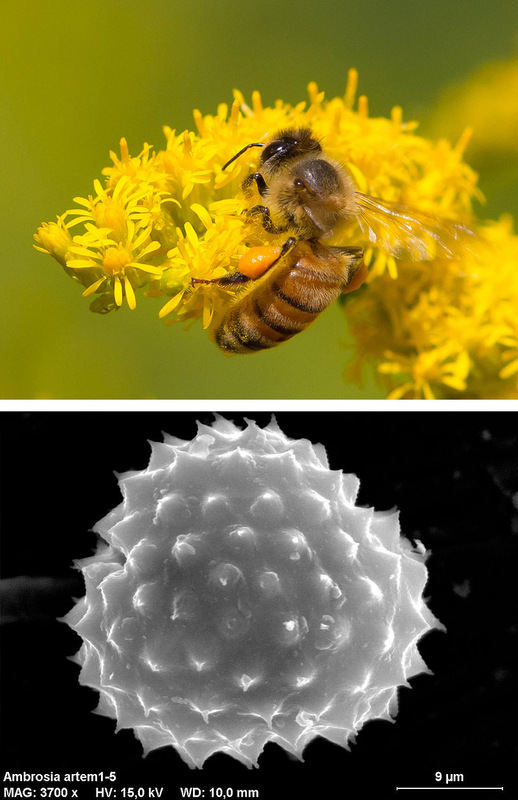 But in the pollen realm it’s heavy—and is also very sticky—and it is not able to be blown far from the plant. It’s not that goldenrod pollen would not trigger an allergic response, it’s just that for such a thing to happen, someone or something would have to deposit its pollen directly into your schnozz. And in general, bees are not in the habit of doing so. Not only is goldenrod guiltless of allergic assault, it has been used as an alternate source of rubber. Henry Ford was intrigued by the potential uses of goldenrod, and reportedly made some tires based on the plant in the 1930s. Interest in goldenrod was revived during World War II. 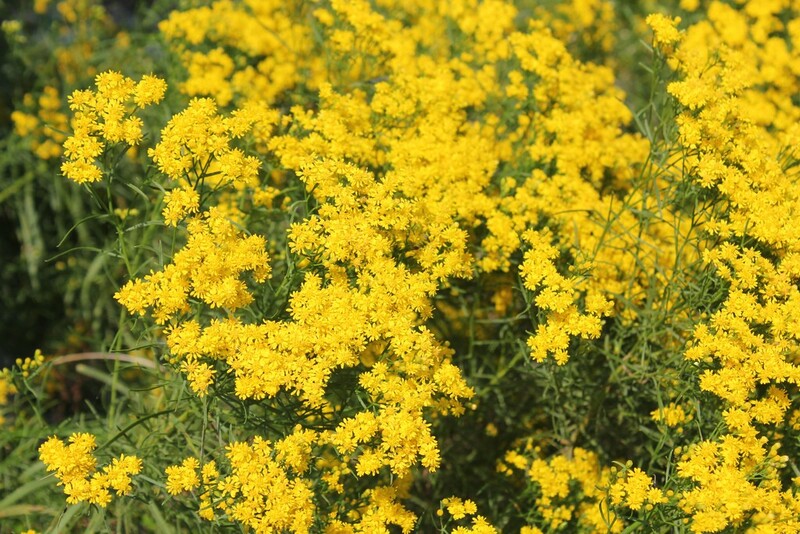 Goldenrod is also used in herbal medicine to help treat kidney stones, sore throats and toothaches. So who’s to blame for the spike in late summer allergies? Surprisingly, the culprit is goldenrod’s cousin, ragweed, although it doesn’t behave at all like its golden relative (I suspect we all have a relative or two like this in our family tree). Ragweed, another native plant, is also in the aster family, but unlike goldenrod it churns out loads of very light pollen. Just how light is it? Ragweed pollen can remain airborne for several days, and significant quantities have been found as far as 400 miles out to sea. And a single ragweed plant can produce a billion pollen grains to fly on the breeze and make you sneeze. Yep, this is the stuff that stuffs you up. 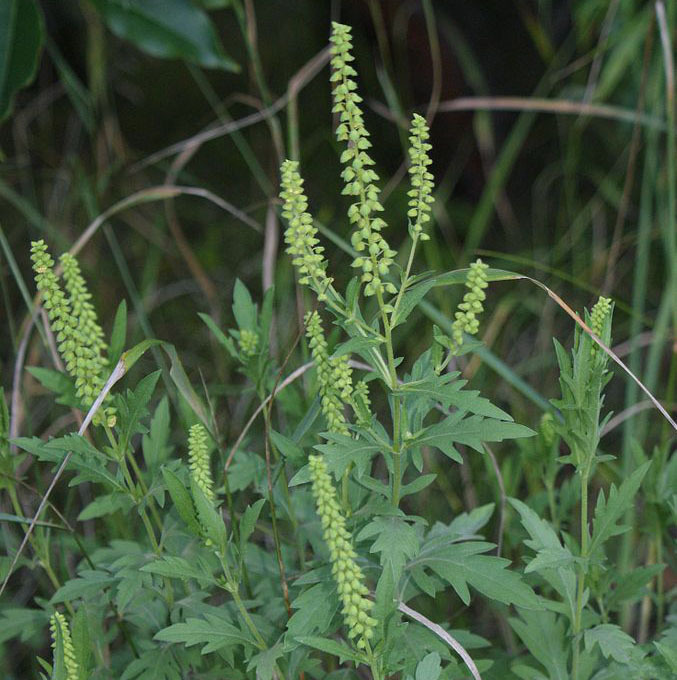 One reason we don’t suspect ragweed is that its blossoms are dull green and look nothing like a typical flower. It’s as if they’re trying not to attract attention. You can almost imagine them thinking, “heh, heh—let goldenrod take the rap.” The reason ragweed is inconspicuous is that it’s wind-pollinated and has no need to “advertise” with bright colors and sweet nectar to entice pollinators. Turns out it’s way easier to attract wind than bees. Most ragweed species—there are about 50 of them—are annual, but they come back year after year from the copious seeds they produce each fall. Ragweed will keep billowing allergens until the first hard frost, so let’s hope it’s not too much of an extended season this year. And let’s try to spread the word about goldenrod to spare it any further false accusations. I like goldenrod and all wildflowers. I think the only thing I am allergic to is poverty. I hate poverty.